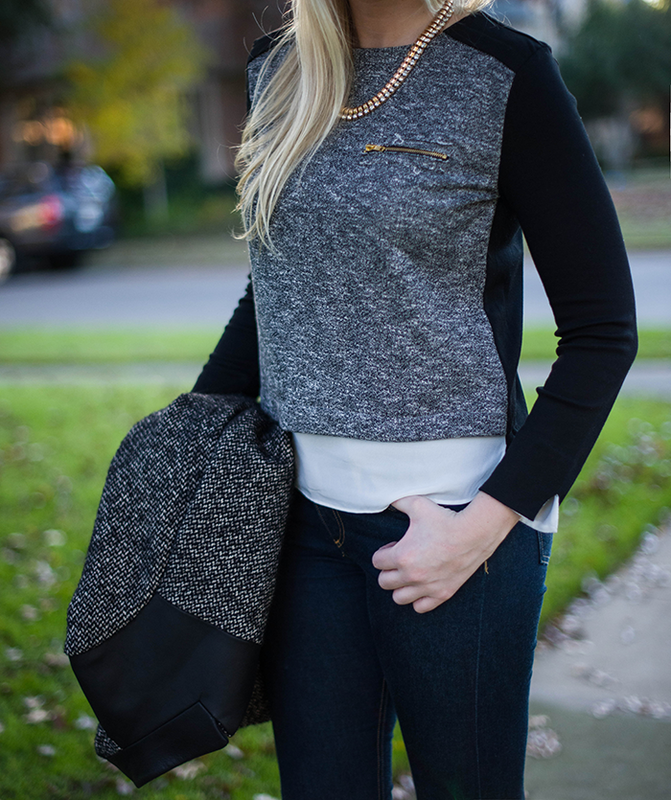 Another piece I’m coveting right now with the up-and-down Texas weather is this “layered” top from Goodnight Macaroon. The white layer peeking out at the bottom isn’t actually a separate shirt, but just a stylish sewn in section that adds a little depth to the piece. It’s just the right weight and isn’t bulky, considering there isn’t an extra shirt underneath! I also love the gold zipper detail – it’s a bit unexpected with the grey + black color combo, so it pops beautiful against it’s muted background. This two-in-one gem is only $70, making it even more of a steal. This post was sponsored by Goodnight Macaroon, but all thoughts and opinions are my own. Thanks for supporting the brands that make The Style Scribe possible! I love the top and coat paired together! you photograph so well :) who takes ur pictures. love this look like all the looks u put together. I love this top! I’ve never ordered anything from Goodnight Macaroon…would you say the blouse runs true to size? Yes, I’d say they are true to size – I ordered a Medium and I wear a size 6! Hope that helps!! simple but chic, i love when outfits look effortless! This is such a pretty look! 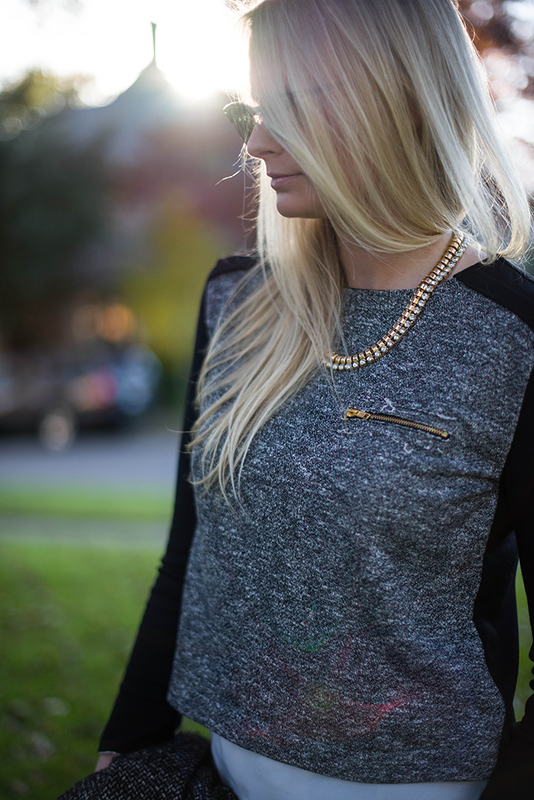 I love the gold zipper detail on the top too! Ooh, I love the zipper detail on the top. I love little elements of interest like that on classic pieces. Very nice outfit! Love love that top!! I love the different textures, and the faux under layer. And the zipper is fab. What a perfect top! Beautiful! I love how the coat and top match. 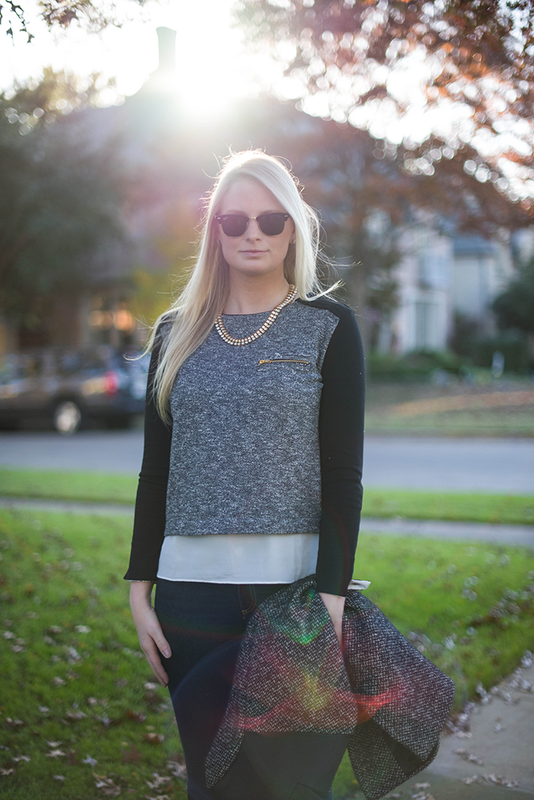 I love this shirt and how you styled it! I think I might have to pick one up for myself! You look absolutely crazy stunning/beautiful! 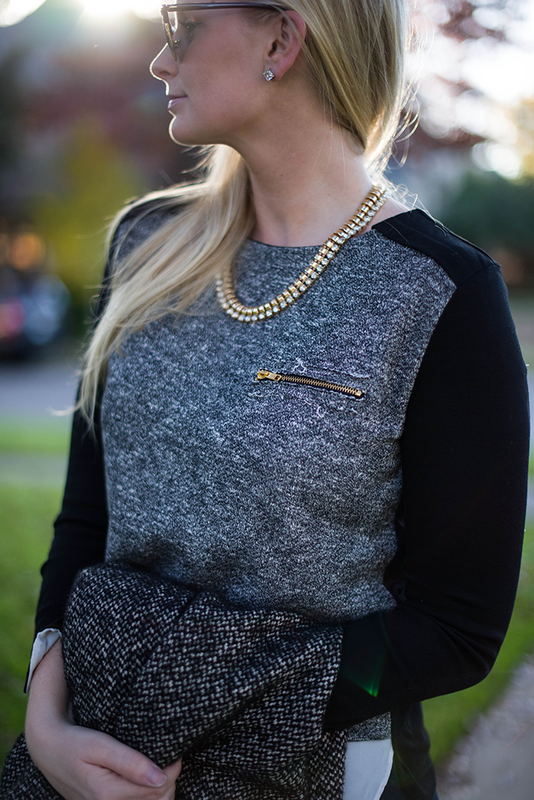 LOVE the sweater + necklace! The weather here in Hollywood is finally cooling off – I kinda miss the heat myself. I love this outfit, the top is so pretty and great coat. Oh how I love that sweater!!! And with your coat draped over it? Perfection! Love the gold zipper! Such a unique and pretty top! Love this outfit and those jeans I must have! 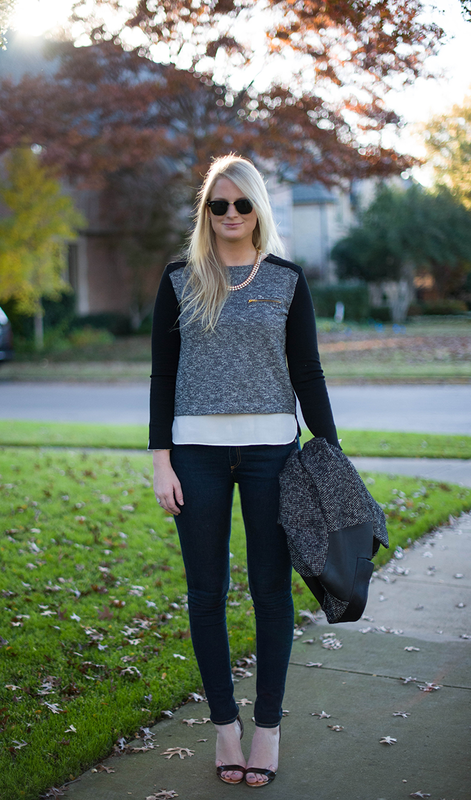 Love this casual look! These jeans look super flattering, are they comfortable? I’ve never tried Rag and Bone jeans before. Pretty tweed on tweed look. You’ve perfected the art of back lit photos. they look so nice! I know what you mean about the weather…it’s rainy and warm in Houston today. ugh! Anyhow you look great! Merritt, you look amazing! These photos are beautiful. Loove your style, perfect combination! And this coat is simply amazing!